Helps protect your bumper from dings and scratches. Made up of high quality Pvc Which is a good Shock Absorber. Customized as per Bumper profile. 100% Original 3M Tape Used. 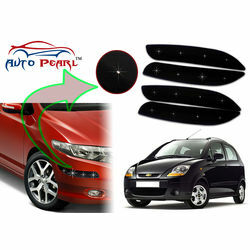 Helps protect your bumper from dings and scratches.Protection to bumper paint.Made up of high quality Pvc Which is a good Shock Absorber.Enhance the Aesthetics of your car.Customized as per Bumper profile.100% Original 3M Tape Used.